After the stylish attempts by Sony to recreate underground maps using Walkman Headphones that I wrote about last week, I came across another interesting poster campaign that I found equally nice. Visit-London is a website that acts as the "Official Website for London" and is part of London's increased advertising campaigns that will gradually increase towards the hosting of the Olympics in 2012. "Visit London" has detailed information about how to travel around the city, tourist attractions, places to stay/eat, etc. As I live in London, most of this information is actually of very little use to me because I know where I am going to be staying (my place!) and hopefully know of enough good places to eat to cover most peoples' tastes. However, their most recent ad campaigns caught my attention. Visit London Poster as found on the VisitLondon.com Media Page. 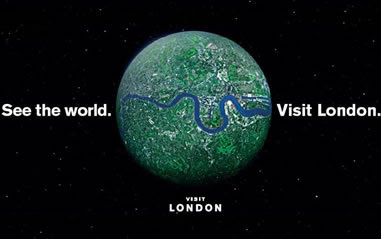 The "Visit London" poster is essentially the Earth with a detailed aerial photo of London stretched across its surface. The slogan "See The World...Visit London" is also very catchy and, in my opinion, a fair reflection of the cultural diversity that London as a city has. As I have mentioned before, one of the main things I am quick to criticize in advertising is a poor slogan, which is why I am glad to see that this has a simple but exciting message. Other variations I believe there to be are along the same route such as "See the World...See London", etc. The image is also quite striking and makes a good use of the famous path/bends of the Thames. If the image hadn't been put together as well as it has I would have feared that the poster would have been advertising episodes of Eastenders, but thankfully the message hasn't been lost by over-complicating things. That reminds me of one of the more recent Apprentice episodes in which the two teams were asked to design and make a TV advert for a box of tissues. The end results varied dramatically. One ad was very artistic in comparison and seemed like a well filmed commercial. The other ad was a poorly acted, and very "in-your-face" type of commercial that repeated the name and benefits of the product far too many times. However, the well-made advert lost the task as it was overly-complicated and the message of the ad (buy our tissues) was lost within it. The other ad got the message across and left no doubt in peoples' mind what they were trying to sell. These "Visit London" posters are much the same. They contain at most 5 words and a web-site address. Within this "Visit London" is mentioned twice! Good image and I know what it is trying to promote. Job done!